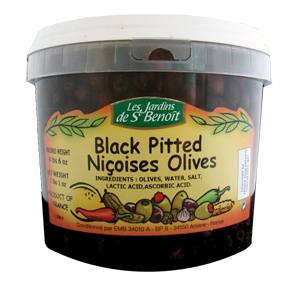 Black Pitted Niçoises olives in plastic pail (caliber 60/65). Olives, Water, Salt, Acidifier: Acid lactic, Antioxidant: Ascorbic acid, Preservative. Size (in): L 15.9" x W 15.9'' x H 6.9"